Fading LED with ATtiny85- A Candle like Circuit Sculpture using Attiny85,LED,3V Coin cell and some copper wires ! This project was created on 12/09/2018 and last updated 5 months ago. This is a simple project that uses an ATtiny85, one LED , coin cell and some some copper wires. My intention is to make a circuit sculpture which looks like a candle . Let me explain this project with a nice introduction..! let the wires that connect components become art! So this is simple circuit sculpture which fades an led using a ATtiny85. Also here I will be describing how to program ATtiny microcontrollers using the Arduino IDE in the build instructions. Put the 10uF capacitor between ground and the Arduino reset pin. Make sure to keep an eye on the capacitors polarity (ground to ground!). using, be sure to use another PWM capable pin. Also you can get Code and circuit diagram from my Githubpage. I really like the coin cell as the base for this, nice touch! LED fading in and out using 555 timers. The aim of this project is to create large scale LED panels using WS2811 LED's for club an venue use. DIY flat coils and wireless energy transfer circuit project, that works like a joule thief but with wireless capabilities!! 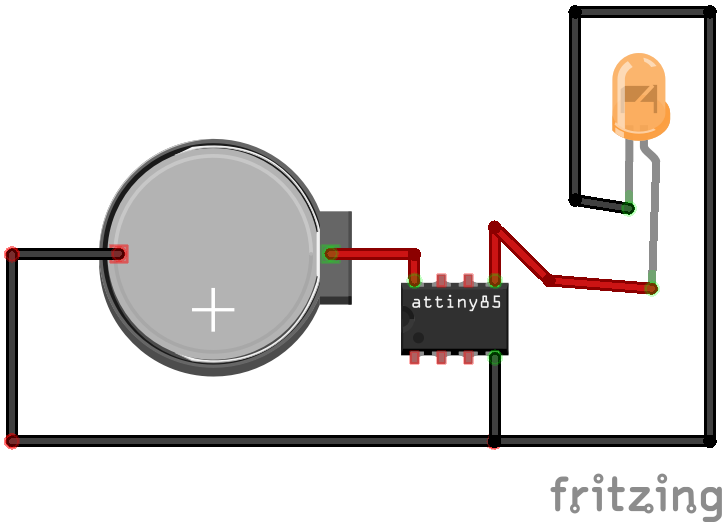 You are about to report the project "Fading LED with ATtiny85", please tell us the reason.